When I spotted this amazing fabric from John Lewis, it was a definite must-have! I think it's one of the most awesome fabrics ever! I decided a wanted to make a top, and because the pineapple print is quite busy I didn't want it to seem like too much. I chose to do a Tilly and the Buttons contrast yoke Coco hack (you can find the tutorial here). I love the Coco pattern, and I've been wanting to do this hack for a while, and I think that this was the perfect opportunity. 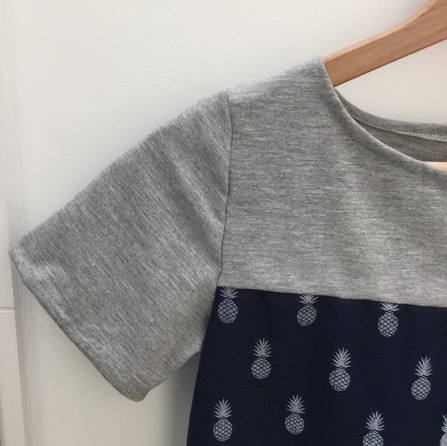 I paired the pineapple print with a lovely light grey jersey, also from John Lewis. As with all of Tilly and the Buttons patterns and tutorials, this one was really easy to follow. 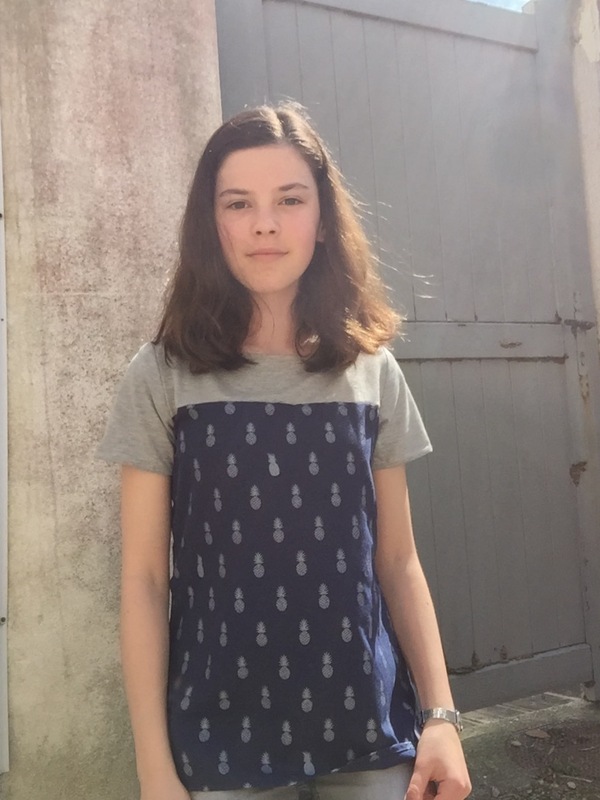 The steps are very simple, and the whole top sewed together really quickly. Also, there wasn't any problem sewing the two different fabrics together, which was good, as jerseys and cottons don't always sew well together. It seems like I might finally be able to wear some of these summary makes, as the weather warms up, but I won't speak too soon! The back is exactly the same as the front (apart from the front neckline being lower) so the only thing to take care of is matching up the bottom of the contrast yoke, although this isn't very difficult. Overall, I'm so happy with this top, I know I'll be wearing it all summer long! Hi Anna! Your sewing is just lovely! I'm so impressed! I started sewing around your age too. I'm so happy that you commented on my blog so I could find my way to yours. I have a daughter almost your age who is learning to sew. It is such a great skill to have. Keep at it because you are already very talented. Thank you so much Shirley! What a lovely thing to say. This looks great Anna! I love that pineapple fabric too and you've combined it with the knit fabric really well. It's so satisfying to make staples like this that you know you'll get so much wear out of! Thank you! Yes, I agree, staples are definitely the way forward! Nice fabric! I might look out for some of this!